For solutions to their difficult welding and fabrication problems, this specific client turned to All-Type Welding and Fabrication for help producing a component for fuel cells. ATWF fabricated a stainless steel sparger assembly that serves as a supporting component in the fuel cell industry. The ATWF team worked with engineers over a twelve-month span to suggest an improved design and cost reduction. Upon completion of the project, ATWF received praise from our highly satisfied client. For more information on the challenge, the process, and the results of this project, download the full Project Profile below. For more information on other products and services contact us. The most demanding industries often turn to All-Type Welding and Fabrication, Inc. for solutions to their difficult welding and fabrication problems. ATWF has provided meticulously crafted projects for use in spacecraft, jets, military aircraft, medical devices, foodservice applications and more. It was no surprise when a customer in the alternative energy industry came to ATWF requiring acomponent for fuel cells. The customer knew our engineers bring decades of experience in metal fabrication and welding design, prototyping and production. The customer needed a stainless steel sparger assembly for its fuel cell product. They wanted to improve the design of the product while meeting an array of demanding specs and reducing the cost of the component. Working closely with the company’s project engineers over a full year of careful consideration and shared ideas, ATWF’s engineering team built a deep understanding of the sparger component, and how it worked with the fully assembled product. 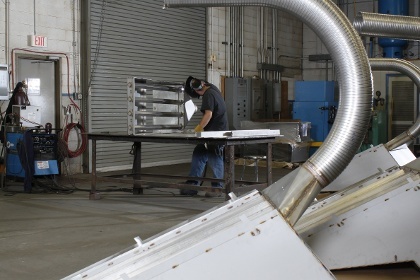 The blended knowledge of welding, metal fabrication and various production and assembly techniques helped ATWF develop a process that met all specs using a more efficient and effective manufacturing technique. And the engineers’ design ideas were extensively tested for feasibility before going into production. ATWF applied a variety of tools and skills to build the sparger, which weighed 127 pounds and measured nearly 5.5’ long. Following the customer’s design specs and adhering to material spec requirements, the 14-gauge 304 stainless steel was cut with a Trumpf TruLaser 5030, and then bent and formed with the Trumpf TruBend 5230. ATWF expertly TIG welded to American Welding Society (AWS) specifications before assembling the final product and applying a scratch-free 2B finish. ATWF worked within a tolerance of ±0.005” throughout the build. To finish off the project, an assembly number, vendor name, date, and purchase order number were laser-etched onto the sparger, which was then rigorously inspected by ATWF’s in-house inspectors to ensure complete perfection. Finally, ATWF packaged the product while meeting ISPM-15 requirements for overseas shipping. Pay less, get more: ATWF delivered exactly what the customer wanted. The sparger works flawlessly in the assembled fuel cell, and the savings pile up with each unit made because ATWF’s solution proved to be less expensive. Our process is built with one thing in mind: your success. The engineers at ATWF are flexible, capable, and always strive to deliver the best outcome possible. We know we have to listen to our customers to fully understand their needs and the demands of any given job. We gladly make site visits to gain a comprehensive understanding of difficult projects. Our SolidWorks software can read plans made in virtually any 3D modeling program, so we can quickly assess and exchange blueprints. We’ll make your project easier on you while delivering a product that meets the highest standards. Contact the experts at All-Type Welding and Fabrication to learn more about this project, or to see how our experience can solve a metal fabrication or welding challenge you might be facing. Product Description A sparger assembly used within an alternative energy application. Overall Part Dimensions Material Thickness: 0.078" Width: 28.000" Length: 65.500" Height: 27.100"
In-Process Testing/ Inspection Performed Inspected Per Customer-Supplied Inspection Plan Involving Angle, Position, and Visual Components; Material Certifications and Process Certificates of Conformance.